A truck convoy passes through southern Saskatchewan, on Saturday, Dec. 22, 2018. 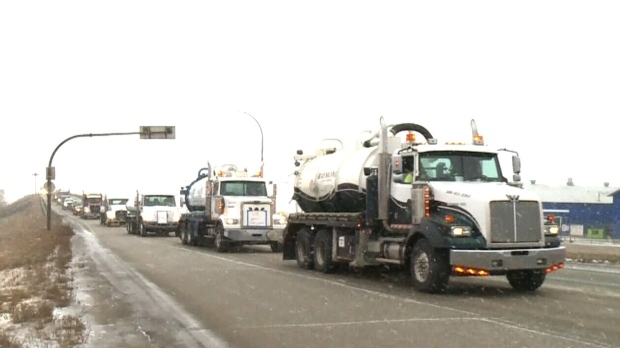 A national truck convoy heading to Ottawa protesting the federal government’s carbon tax, a lack of pipelines and other issues is expected to roll through Alberta and Saskatchewan on Thursday. The convoy starts in Red Deer on Thursday morning, then heads straight south towards Calgary before getting on the TransCanada Highway. It will then head through Medicine Hat and Brooks before crossing the Saskatchewan border and passing Swift Current. The trucks will roll through Regina sometime that same day before stopping for the night and ending the first leg of its trek to Ottawa. “We want the carbon tax repealed or at least revisited, because it’s not working the way it is, we want pipelines in the ground, and we want them to look at the UN compact for border control,” Carritt said. Carritt says this isn’t exclusively a yellow vest convoy, although many of the points the convoy hopes to make in Ottawa are shared. After the Regina stop, the convoy will continue onto its second leg of the trip through the rest of Saskatchewan, before making its way through Manitoba and Ontario. It’s scheduled to arrive in Ottawa next week for a rally on Parliament Hill.